So thankful for this message by Kris, expressing the heart of God, the truth of the Word of God, the heart of Bethel leadership, and the deceptive teachings that are merging into our stream. He clearly defends the truth of a literal place called hell and the judgement that awaits those who are not in Christ. Many are embracing Christian Universalism: denying the reality of hell being a place of torment and teaching that all are already saved whether they know it or not. Thank you Kris! Love you so much! Finally!!!! I found my tribe! It’s great to find like minded believers who are “fool emough” to believe God at His Word! Thanks for your faithfulness, boldness and for venturing out in the somewhat unknown reality of the Kingdom of Heaven in us and here on earth! You rock! So uplifting, encouraging , & helping me press in to move mountains! What?!?! Is this a podcast from an active cult? This is bizarre to say the least. This isn’t the same Christianity I’ve ever known. I love the real and rawness of their messages. You can tell they love the Lord and his word and I just leave so challenged at the end of a sermon. I am challenged in a good way and encouraged. These messages help me in more ways than I can count. Did you speed these up? My last to podcasts played at record speed. I’ve heard both of these pastors in person and don’t remember them speaking so quickly. Having a hard time listening. My daughter lives in CA and turned me onto Bill Johnson, who has multiple inspirational messages. This is my first Eric Johnson podcast which also seems to be inspirational. However, in order to honor truth, Steph Curry is NOT the first one (even instrumental) in changing the game by shooting long three pointers. You Californians must not have ever watched the NBA finals before the Warriors played in them. He may have worked hard to perfect his game but he only perfected what MANY others have done before him. Watch Miami, Cleveland, San Antonio, Dallas, Houston..... Watch Reggie Miller with Indiana. Sorry, Curry has not ‘changed’ the game. He’s simply really good at what he does. His achievements aren't even close to as important as Rosa Parks’. Now that we’ve corrected that falsehood, thanks for your message. Hopefully, those of us who do not live in CA can continue to be inspired spiritually. Sports, especially the NFL and NBA, have become too political and secular to be spiritually inspiring! Bethel is a powerhouse of truth! It’s a gift to be able to connect with the dynamic work of Christ globally. So many messages from Bethel have ignited a passion in me to fully live for Christ. Biblical insights and practical wisdom continue to help equip me for kingdom-centered living. Always look forward to this download! I love this message. Quit throwing stones. I have listened to every sermon for the past 11 years, and I have yet hear a bad one. Love the teachings, stories, and empowerment that comes from this tribe. Bless you guys. I’ve been following Bethel Church since 2009 and to witness the growth from then to now is so inspiring. This is a truth-based ministry, biblical in practice and driven by the Presence of God, not the traditions of men. I love the humor, the heart-filled wisdom, the transparency of each presenter and the working together of the 5 fold office. I feel as if I’m a part of the church and I live on the other side of the country. You won’t need your Bible. Expect story after story of unverifiable experience and zero exposition of Scripture. Man centered, Jesus demoting and man exalting verbal mush. If it’s true what psychologists say: that you are the average of your ten closest friends/family members, then it has GOT to be true that you are also the average of what you listen to! Fill you mind with average Netflix fare and you will be... average. Tune in for incredible podcasts by anointed Bethel pastors (and gifted educators) and you will find yourself stepping into an expanding, healing, life-changing mindset that will ultimately spill over into your every day living -resulting in freedom and wholeness is Christ! I listen and re-listen to these teachings supplementally to the Word of God, to keep my spirit stirred up and my heart excited for all the Lord is doing, has done, and will do. I can’t recommend this enough for anyone who has anything in their life they would like to change or feel differently about! True change always begins within us. Started listening to this ministry last year and I have been rocked by Bill Johnson and the Bethel ministry team. You will enjoy these teachings. Thank you for introducing me to freedom! I get more shocked by how insightful these messages are in 40 min., then I do at most of my local churches. Especially Kris Vallotan. That guy is incredibly wise, and not only that I feel like I'm really starting to understand what it means to be a Christian. Bethel really is a cut above, and it's a shame that there aren't more messages here. Find a solid bible preaching church. Best Christian podcast out there. There so much annointing and revelation in there sermons. They dont preach at you, they equip you to change the world!! It has been so impactful in my life there messages. My favorite place to visit is Bethel Church because the Holy Spirit is manifested there ans there is so much love and honor to all people. My first bethel podcast has was a repot of a trip where there were hundreds of healing. I thought this must be for ratings but it wasn't this man lives by the spirit and is intellectual beyond my dreams. Thanks for providing the most convicting sermons I hear. You drive me to pursue God more in my day to day. I definitely feel the spirit when I listen to this. Bethel has helped me grow so much as a Christian. I am walking in the Holy Spirit and in faith and expectation of God, like I never have before. I am grateful for the Bethel, their leadership, and Bethel Music. They are such an inspiration and guide to me. I appreciate them so much. They change my life for the better every week. I have a Bethel TV subscription too, and that is also a huge blessing. The heresy taught from this church is not only wrong, false teaching and misleading, Its dangerous. Don't listen to this podcast. They mix in a little biblical truth with blasphemous personal revelation. You have been warned Proverbs 30: 5-6 Every word of God proves true; he is a shield to those who take refuge in him. Do not add to his words, lest he rebuke you and you be found a liar. I don't think they know what a bible is at this church. They discourage reading the word of God and pour gold dust on people during service saying it's God's anointing. Steer clear of these people. Very good sermon content, but do you think we could somehow get the "SO GOOD" guy in the crowd to shut up? It's distracting. I love the Word and this is one of the ONLY gatherings that I listen to outside of my own. Bill Johnson and the Bethel team always have an empowering word in season. The messages are spirit-breathed and up-lifting. Life-giving. Jesus-centered. Bible-based. Truth. Bethel's culture is changing culture everywhere. Truly amazing church. This is the best place to learn about the bible. Just what I need when I need it! May He bless Bethel with all they need to share the gospel. I love all what you doing! is like going home when getting there. False teachers lurk among us. The gospel they preach is far from biblical. I'm finding it hard to express in words the blessing this podcast has been to me. 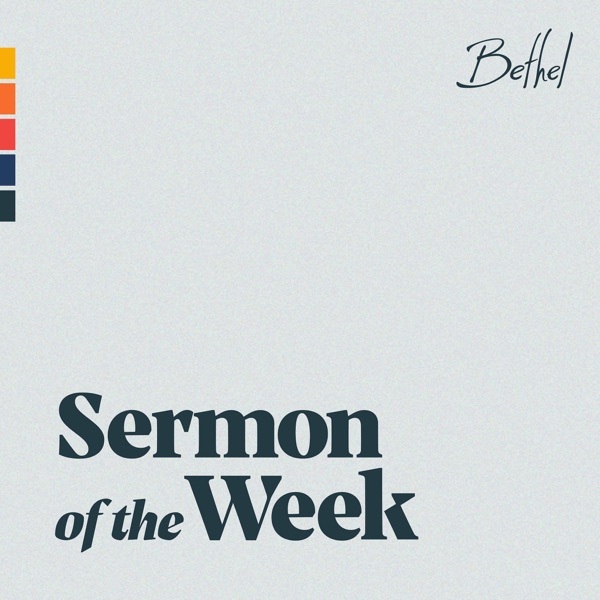 I thank God for Bethel sermon of the week, He has used the team at Bethel to such timely, empowering words into my life. Whether it's Senior Pastor Bill Johnson or a student speaking, I've been tremendously blessed each and every time!!! Eric has really hit the nail on the head (so to speak) Because of what Jesus did on the cross we are free from sin & sickness, but because he rose, the fear is gone. We become untouchable with fear! Wow! Inspiring messages from a great church! The teaching is deep and touching the heart. Incredibly powerful messages! Love it so much I traveled across the country to see you in Cleveland. Thank you so much for providing beautiful and inspiring content every week. How to live a life worth living. Such a great message very life changing!